Place an item as evidence inside a wealthy home. "Get in, plant the goods and get out. Quiet and neat." Talk to Vex in The Ragged Flagon about shill jobs and receive the evidence. Enter the house and put the item into the targeted chest. Report back to Vex for your reward. 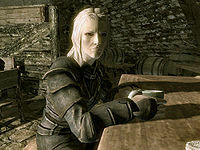 After you are a full member of the Thieves Guild, you will want to start thieving for fun and profit. By now, you will have met Vex. She handles all the burglary, shill, sweep and heist jobs. In order to earn some gold and help Vex with her goal of restoring the Guild to its former glory, ask her for a shill job. She will inform you that a client has requested someone be taken out. Unlike the Dark Brotherhood, the guild does this by planting evidence in their home and tipping off the guard. Vex will give you a stolen item that needs to be placed as evidence. The item is a randomly-selected gem or unenchanted piece of jewelry (circlet, necklace, or ring); see Leveled Lists for full details. The item is identical to a standard item, except that "Stolen" has been added to its name. The quest can send you to any wealthy house, which amounts to twenty-nine possible houses. You may be assigned the same location more than once. You need to enter the selected house undetected and find the designated chest. Open the chest and place the stolen item in it. Although there may be multiple containers in the house, only the chest indicated by your quest marker will work; if you attempt to put the stolen item into the wrong container, you will be told that you can't remove the item from your inventory. If you are sent to jail while the quest is active, for any reason, you will fail the quest. Getting caught in the house or killing anyone living in the house will also result in failing the quest. You are not responsible for tipping off the guards after placing the evidence. Once you have planted the evidence, return to Vex for a leveled gold reward. Even if you complete the job successfully, there are no obvious repercussions for the person you have framed. They do not go to jail or otherwise become inaccessible. Despite the Stolen indication in the item's name, the item given to you will not be flagged as stolen. If you have already participated in the quest Battle for Whiterun it becomes impossible to enter some homes in Whiterun, namely Heimskr's House and Severio Pelagia's House. However, they can still be assigned as a possible quest destination. The chest you must plant the Stolen Flawless Ruby in Uthgerd's home may already contain a Flawless Ruby. If you steal the contents before planting the Stolen Flawless Ruby and already have a stolen flawless ruby in your inventory, it does not register that you have planted the one given to you by Vex. Placing the ruby in the chest that is labeled Stolen Flawless Ruby does nothing in regards to completing the quest objective, and taking it back out simply adds it to your already existing inventory of flawless rubies. If you autosave on travel, just reload the Uthgerd's House save and place your current flawless ruby inventory into another container or drop on the ground. The "stolen item" might disappear from your inventory for no obvious reasons and you'll be unable to complete the quest. To fix this, use setstage tgrdu 10 in the console and it will take the quest back to the stage that Vex gave your character the item. Quit the job and retake it for another location (you can load a previous save to avoid a failed quest if you wish). This will give you a different item as evidence. The item disappearing may be due to the item being a gem, and the stolen gem being used to smith a piece of jewelry. I've planted the <Alias=Evidence> in <Alias=WealthyHome> in <Alias=City>. On the PC, it is possible to use the console to advance through the quest by entering setstage TGRDU stage, where stage is the number of the stage you wish to complete. It is not possible to un-complete (i.e. go back) quest stages, but it is possible to clear all stages of the quest using resetquest TGRDU.